'Segregated' Dog Runs: Coming to A Park Near You? Sheepish Grin: Not everyone thinks segregated runs are necessary. 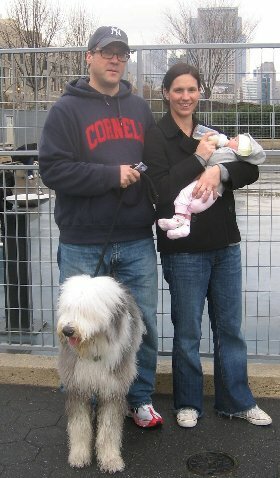 Pearl, an (almost) two-year-old Sheepdog, with parents Derek and Andrea and newborn baby, Cookie, shown here at the Leroy Street Dog Run, think things are fine just the way they are. "Pearl loves little dogs," Derek says. "We come here all the time." Small dogs and big dogs have lived together in New York for a long time. But an increasing number of city residents with small dogs-Chihuahuas, Yorkies, Pomeranians, Shih-Zhus and others-say there's no room for them at the dog run. Small dogs, they say, need room, too. A slight drizzle coats the Leroy Dog Run on the banks of the Hudson River, making the ground slick enough for a large Golden Retriever to paw-ski into a bench, narrowly missing a smaller dog. "The surface is a tennis court now," explains Lynn Pacifico, President of the Dog Owner's Action Committee of the New York City Dog Owner's Group, who is also concerned about a gate that opens too close to the nearby West Side highway. She says it took her and others, with help from the community board, over a decade to wrestle this patch of land from state-run Hudson River Park. Even so, the surface and the gate are not the only things concerning Ms. Pacifico and Tod Wohlfarth, chair of the 75-member Friends of Leroy Dog Run. They want a separate run for smaller dogs, even if that means moving to an area between Leroy and Clarkson on Hudson, now slotted for luxury housing. "There have been a number of incidents where small dogs have gotten killed or injured by larger dogs at the present run," Ms. Pacifico says. "And people don't come back." Segregated dog runs, where small dogs can play with small dogs and large dogs with large--is a growing idea throughout the city. Even Terri Sullivan, in the midst of heading off a challenge over dogs being in Queen's Juniper Park at all, is already planning a small dog area "for the owners' comfort level." But it's not just a matter of building a fence. In sprawling Fort Tryon Park in the northern tip of Manhattan, the suggestion of carving a space for small dogs out of Sir William's Dog Run reportedly sparked heated confrontations; a Parks Department Official is now mediating. "A lot of people with small dogs from downtown are moving up here," says Teresa Vega, coordinator for the small dog run, now scheduled to open this spring. "Our group alone has 25 people who intend to use the small dog run, and more are coming." Jenn Bristol, one of the founding members of Sir William's Dog Run, was among those initially resistant to a small dog area. But she agrees many "downtown" people with smaller dogs moving here in search of larger apartments and lower rents have compelled considering one. "It was always our intention to create a small dog run to reflect what the community wants and needs as it changed," Ms. Bristol says. "With the shortage of space available for dog runs, some dog parks need a little incentive before they segregate a portion of their square footage over to the small fry," Garrett Rosso, manager of the Tompkins Square Dog Run and chair of the Community Requirement committee of NYC Dog, explains. At Tompkins, it became a necessity. "There were over 67 serious dog fights and one reported death in 2001," he says. "Since we installed the small dog area in 2002, we have not had one reported injury to small dogs. It was a very important addition to our park." There is one more large fringe benefit, according to Mr. Rosso, to building a small dog run. "It has more than doubled the amount of visitors to our park," he says. "If you build it, they will come." For background information on the off-leash debate visit our archived articles, unleashed.htm, unleashed2.htm and unleashed3.htm.